Apparently more than a marketing gimmick, LG's G Flex can even defy a knife attack. 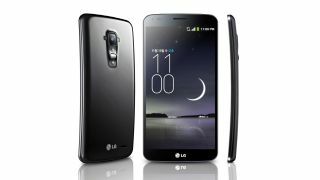 LG has made a big deal about its new G Flex phone, touting the new technology that not only allows the phone to bend under force but also withstand the rigours of daily key-in-pocket abuse. It even went as far as pushing out a video showing the back of the phone (that you can see at the bottom of the article), which is coated in a new kind of polymer, being brushed by bronze bristles alongside a 'standard' mobile phone and in a couple of hours showing no signs of the destruction. However, YouTube user Marques Brownlee decided that this test was too uniform and too regulated to be considered a 'real world' test and (nervously) decided to give his own LG G Flex an attack. As you can see in the video, he first scuffs it with keys (the most common use-case scenario for damage) which shows the phone healing after a few minutes, although he doesn't really go to town on the expensive handset. But we respect his bravery, as he then scores the phone with a knife to see how the polymer coating can recover, but sadly this isn't total. It does get to about 'halfway' to healing after a couple of hours, but still shows the signs of the damage. It's noted that LG uses very warm conditions in its bronze brush test to enable faster healing – this would make sense given the polymer's flexibility, and therefore ability to return to its original shape, would increase with heat. However, it means that in normal conditions, or cold days, things may get permanently scarred unless you carry a portable hairdryer around. Still, it does give the G Flex an added layer of protection previously only afforded to cases, so if this is the first step to invulnerable phones, we're on board.